I finished my squares for my blanket project a couple weeks ago, and now I am on to the sorting and blanketifying process. (Let’s all just pretend that is a real word and move on, shall we.) The sorting process is moving much quicker than the knitting or end weaving processes. I started by dumping them all out and splitting them by neutral, warm and cool colors so there would be less to separate in each group. Plus I had three bags to put these in and splitting them that way made the most sense. Then I took each group and sorted by main color. IN this picture of the cool colors, I have purple, blue, and green, even though there are many different shades in each. Those piles were then separated further into their shades, counted, and bagged with the number on them. Once I had them separated, I went ahead and roughly measured them to even further group them by size. This will come in handy when I go to join them together into blankets. Of course, at first I neglected to realize my L-square actually measures from the outside edge so everything I was measuring was coming out an inch larger than it really was. 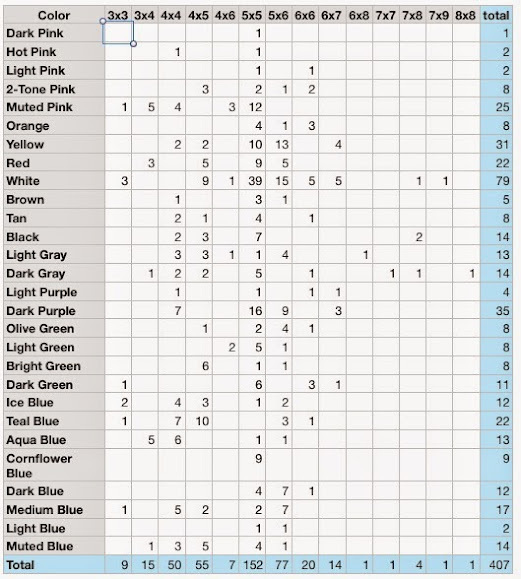 I fixed that and catalogued all the colors and sizes in a nice little spreadsheet for even easier reference when I’m setting up the blankets. The color that was made into the most squares was white. The only color to not have a five by five square was teal. I managed to only make the cornflower blue squares five inches by five inches. I recently got the book 400 Knitting Stitches as a resource for my knitting. As I started looking through all the different stitch patterns, I saw many cool patterns I wanted to try. With way too many random piles of leftover acrylic yarns I don’t want to use for any other projects, I decided to turn this book into a project. I’m casting on somewhere around 21 stitches for each (depending on the number of stitches needed for the pattern), including 4 edge stitches (2 on each side). Obviously there is going to be some variation in the sizes. Once I’m done I’ll stitch them together into blankets for Project Linus. As the title implies, I’m going to attempt to do this in just 2 months. 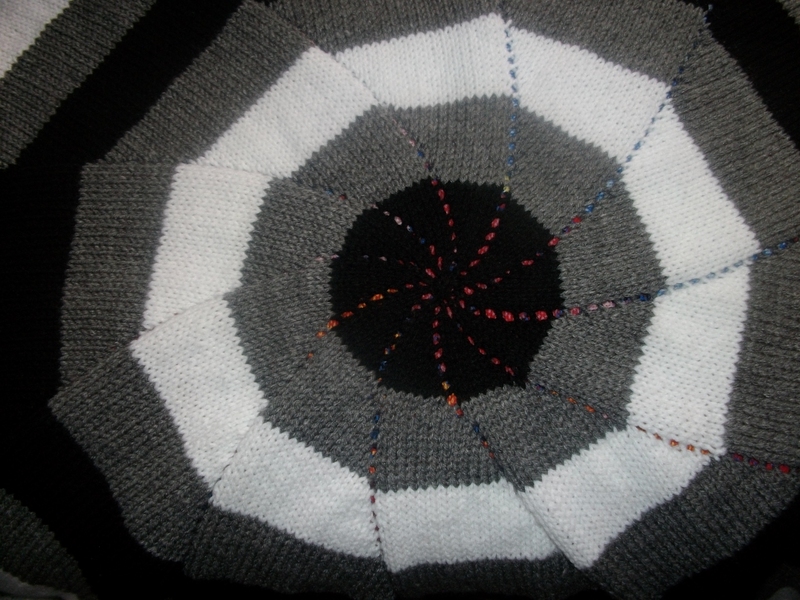 I started on March 29, so I hope to be done making the squares by May 28. 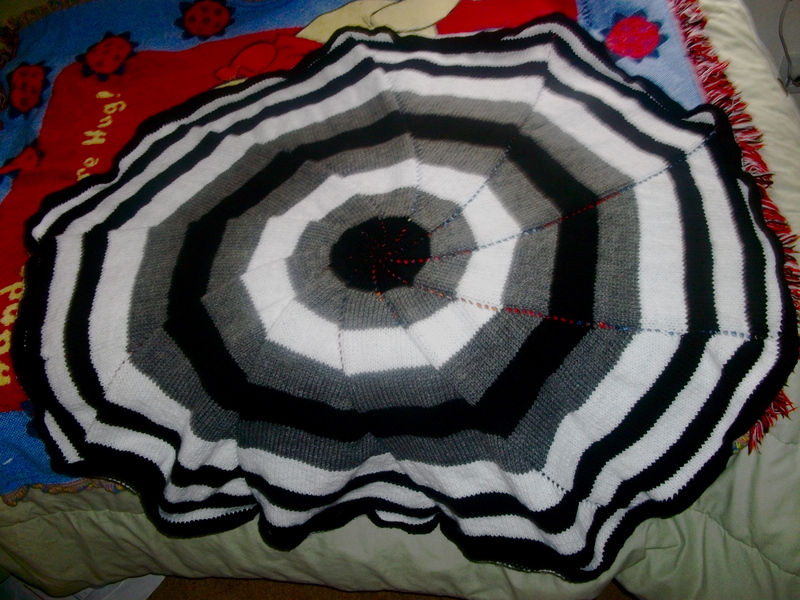 Then I will start the blanket-making process, hopefully getting done within a week or so. Because I don’t want to be making blankets in the middle of summer, even kid-sized blankets. When I first came up with the idea for this, I thought I’d post the pictures of the ones I’d done every day. Not going to happen. But the photos of all the squares can be found in this album, updated frequently. I worked at a quilt shop for a few months this spring, and one of the first things my boss had me do was take a simple Friday night class. 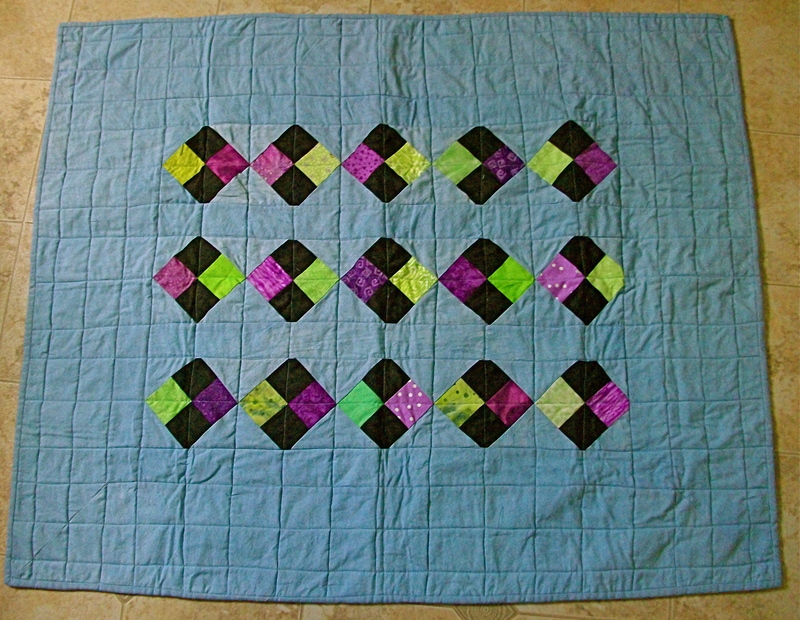 Using Eleanor Burns’ “Whirligig” pattern from her Quilt-in-a-Day series, the three-hour class gave each participant the pieces to make the large quilt and the smallest quilt in the pattern. I chose to make the smaller blanket for my first quilt because it would give me some practice. I hand-dyed the fabric for the background, binding, and backing and assembled the blanket top using my Kenmore sewing machine. I quilted all three layers in a simple checkerboard pattern, keeping it simple for my first project. This blanket will go to Project Linus, a non-profit organization that gives blankets to children in crisis. Recipients range in age from newborn to 17-years-old. They are delivered locally to ill or traumatized children. To find out more about Project Linus or find your local chapter, visit their website at projectlinus.org.